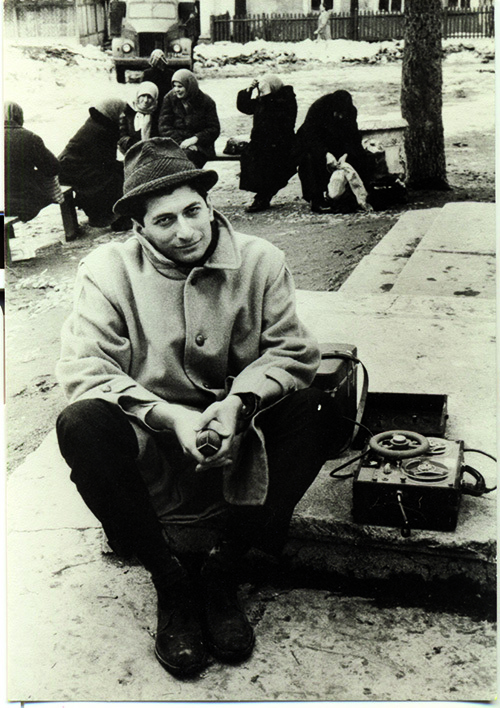 Marvin Kalb in 1956 Kiev. Babi Yar, once a desolate ravine on the outskirts of Kiev, the capital of Ukraine, has now become a painful reminder of one of the worst examples of Nazi brutality during World War II. On September 29-30, 1941, Nazi troops rounded up 33,771 Jewish men, women and children, marched them to Babi Yar, forced them to strip, stand side by side, row after row—and then, with Teutonic efficiency, they massacred them, stacking their bodies layer upon layer and covering them with earth. Everyone knew that tens of thousands were killed then and in later massacres that occurred in subsequent months—an estimated 50,000 to 75,000 Jews in total, along with thousands of Roma and Soviet political prisoners—but no one spoke of it publicly. Not until 1961, when Russian poet Yevgeny Yevtushenko, outraged by the refusal of the Kremlin to acknowledge the slaughter, wrote a poem that heart-achingly captured the tragedy: the helplessness of the Jews, the cruelty of the Nazis and their Ukrainian collaborators, and the indifference of Russian authorities. When I think of Kiev, the city where my mother was born, and when I note this year’s 100th anniversary of the Russian Revolution, I cannot but reflect, in the words of Yevtushenko, that “wild grasses rustle over Babi Yar.” That is when I wonder what would have happened if my mother, Bella, had not left in 1914, fleeing the omnipresent anti-Semitism and the onrush of a world war. Friday evening, I went to the Podol’s only synagogue and found people already gathering for prayer. Seeing me—standing, it seemed, a head taller than many of them—they immediately gushed with questions. “Where were your parents born?” many of them wanted to know. A key question, as it turned out. “My mother was born in Kiev, probably right here in the Podol,” I replied. What I would later come to appreciate as the highlight of my visit then unfolded—one question, one answer at a time. “When did your mother leave?” an old woman in a babushka asked. “Bluma,” I replied, giving my mother’s Yiddish name. Overwhelmed, I burst into tears. Bluma, the daughter he remembered, was my mother. After more than four decades—filled with war, revolution, collectivization, famine, more war and then the Holocaust—this man remembered Volf Portnoy’s daughter. Had my mother stayed, would she have ended up in Babi Yar? Or would she have survived? No one knows. But of one thing I am certain: There but for the grace of God go I.
Marvin Kalb, a former network correspondent and Harvard professor emeritus, is author of The Year I Was Peter the Great: 1956—Khrushchev, Stalin’s Ghost, and a Young American in Russia (Brookings Institution Press), from which this essay was adapted. My mother, Esther Brodsky was born near Kiev in or about 1903. My grandparents were Rose and Charles Brodsky. they emigrated to the states around 1906 living in Cambridge and then Brookline, MA. Your essay brought tears to my eyes.